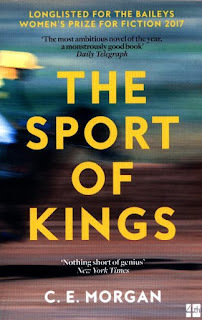 C. E. Morgan’s epic is ostensibly about horse racing, but don’t let this put you off if it’s not something that appeals – it’s a multi-faceted beast which deals with racism and womanhood as well as a plethora of other hard-hitting issues. First we are introduced to the Forge family, a wealthy farm owning family that has a tendency toward tyrannical fathers. Henry hates his father John Henry and ignores his wishes for the family business, but as the novel progresses we see Henry follow in the footsteps of his father in the treatment of his own family. Next we are introduced to Allmon Shaughnessy, son of a black mother and an absentee white father. We see him struggle with the racism that is endemic around him. He is forced into illegal activity in his desperation to help his mother with her medical bills. Her condition and suffering highlights the problems within the health service of America in a truly harrowing fashion. Allmon ends up in prison and it is this which eventually gives him the skills to gain a job at Forge Run Farm, an establishment we are told one of his ancestors was a slave at. The interconnectedness is painful, but Allmon is determined to be the one with the power in the future. He hadn’t reckoned on Henry’s daughter Henrietta however, a strong-willed, intelligent woman who participates in a seemingly endless string of one-night stands and holds within her the possibility of happiness but also destruction. She is an intriguing character. Her mother left when she was still a child, confiding that men always want something from you, but believing her new love was different. Their relationship fizzles to almost non-existent and she is left at the mercy of her father. He exposes her to activities not suitable for her tender age, and we see his father’s obsession with continuing and strengthening the family name manifest itself in an even more sinister form with his daughter. Allmon’s life is difficult from the start. He and his mother are rejected by their local community because of his having a white father, but he is subjected to all the prejudices of the police as if he didn’t. His arrival at Forge Run Farm could prove his saving grace, but Henry is unlikely to make it easy for him. The juxtaposition of these two characters, with such different upbringings but both trapped within a world in which they have very little control, both finding their own way to fight against these restraints form the crux of the novel and lead us into its eventual climax. A verbose, complex novel that hops around in time and voice. Oddly addictive, this heart-wrenching novel is a wonderful read and definitely worth persevering with.